I flew from Punta Arenas to Santiago in CC-BEH, another of LAN’s Airbus A321s, but this one fitted with rather more seats than the flights to/from Iquique and Temuco, leading to much reduced leg room for the 3 hour flight. It looked quite a new aircraft, and checking since the flight, I discovered that it had its maiden scheduled flight on 26th November, so it was only a couple of weeks old. The only problem was that my bag was damaged during the flight, and arrived open with contents exposed. Fortunately, I haven’t yet identified anything significant as missing, but it did mean I had to buy safety pins and duct tape in Santiago to ensure the bag survives the journey back to London later this week! 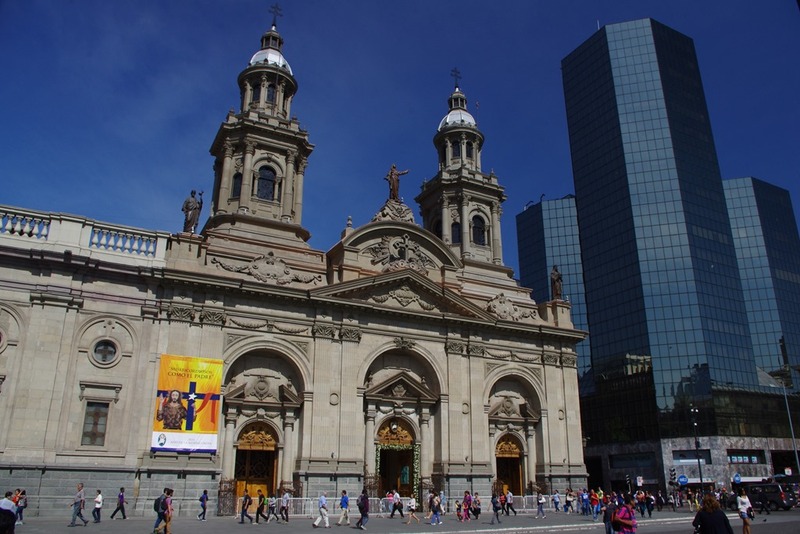 I spent Sunday having a quiet day around the Estación Central district, just to the west of the main centre of Santiago. This is also the area nearest my hotel, so it’s easy to reach. The Parque Quinta Normal is a wonderful surprise; a 36-hectare nineteeth century formal park, in the middle of the urban environment. Entry is free, although it was slightly disturbing that the security guards at all the park’s entrances were wearing bulletproof vests. I certainly didn’t feel unsafe, though, and I got the sense this is just part of standard-issue uniform, rather than a response to a specific threat. The park not only contains paths winding through trees and flowerbeds, but also fountains, a boating lake, tennis courts, football pitch, and plenty of people wondering around selling ice-creams out of large polystyrene boxes with wheels on. I wonder how cool the ice creams can stay without refrigeration; I didn’t try! Somewhat bizarrely (but there’s a certain romance to it), a corner of the Parque Quinta Normal is the home of the National Steam Train Museum. For a very modest entrance fee of 800 CLP (80p), you can see a number of steam engines that ran on Chile’s mainline services from the 1850s until the 1970s. The majority of these trains were American-built, but a couple came from the UK. Opposite the Parque Quinta Normal is the Museum of Memory and Human Rights. This is a really well-done exhibition centre that serves both as a museum telling the history of the rise and fall of the Pinochet Regime, and also as a memorial to The Disappeared, with some of their stories and horrific details of the types of torture that were in practice at the time. In the basement is the document centre, which houses the regime’s archives. Understandably, in an effort to maintain the sobriety of the place, photography inside the museum is banned. Entrance is free but you are encouraged to give a voluntary donation. 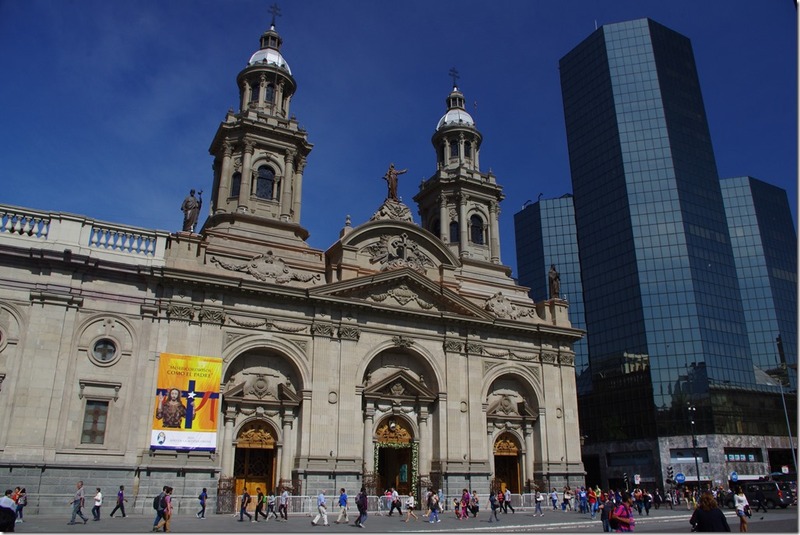 On Tuesday, my last day in Chile, I went to the central part of Santiago, where there are a lot of sights very close to each other. 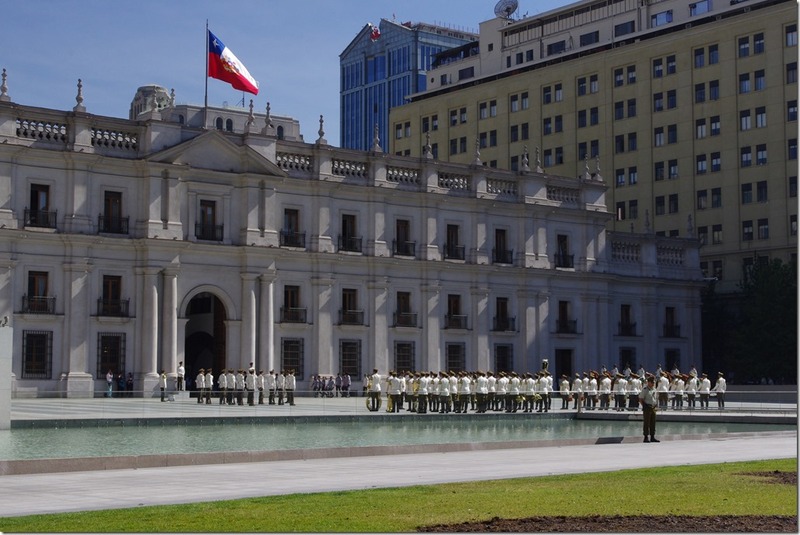 My first stop was at La Moneda, the Presidential Palace. I made a point of getting there just before 10am so I could see the changing of the guard. This is possibly an even more grand event than the one at Buckingham Palace as it involves stopping the traffic on one of the main dual-carriageways through the city so that the band and horse-mounted guards can cross it. It was quite a sight. 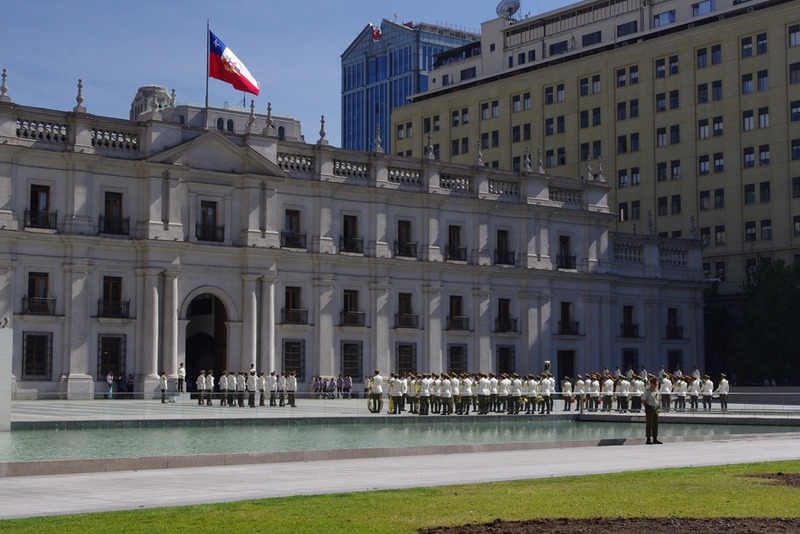 After La Moneda, I went a few blocks north to the Plaza de Armas. This is a lovely open space surrounded by, amongst other things, the Cathedral (below) and Central Post Office (now a postal museum). The Plaza was quite busy but the police were keeping good order, patrolling the square on Segways! Within a couple streets are also the ex-Congress building (which Pinochet moved to Valparaíso just before handing over the the democratic government), and the very interesting Museum of Pre-Columbus Art. 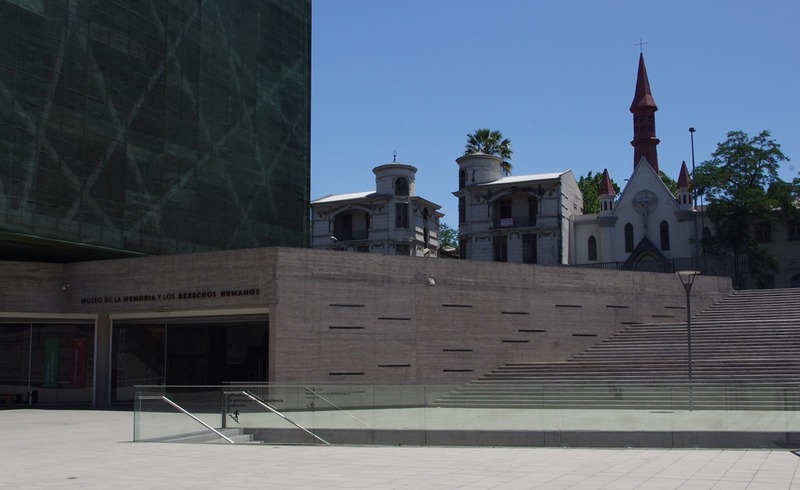 This museum has a relatively small collection of Chilean art from the various native populations in the basement, and upstairs, a larger collection from the rest of South America (principally Peru and Mexico). One thing I learnt is that some of the pre-Inca people in modern northern Chile were practising mummification of their dead as early as 6000 B.C., well before the Egyptians discovered the technique. 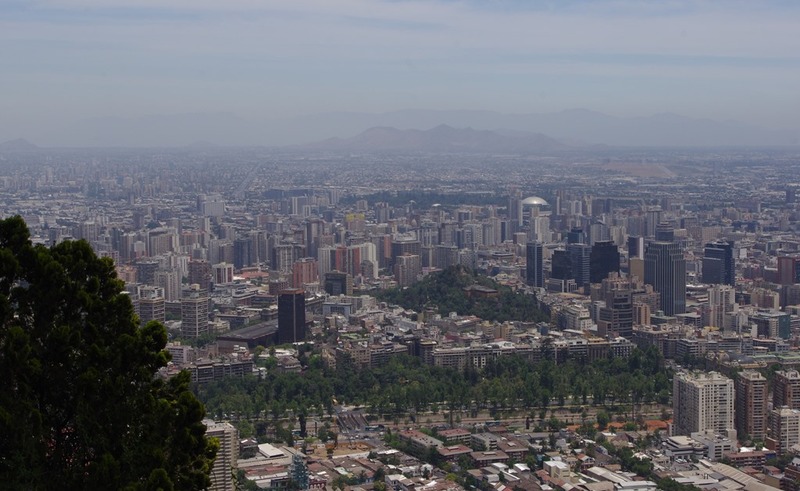 After lunch, I headed to the northern part of the city, to visit the metropolitan park, which is on San Cristóbal hill, about 300m above the rest of the city. You reach the park via a 1920s funicular railway, which costs just 2000 CLP (£2) for a return ticket, and which departs every 15 minutes. The funicular usually stops halfway up the hill, where the city zoo is situated, but that stop is currently closed for renovation (access to the zoo – which I didn’t visit – is by walking up only). On arrival at the top, we were serenaded by a busker playing a mash-up of Silent Night, Jingle Bells and Sloop John B simultaneously on guitar and panpipes. From the park there are some spectacular views over the city, and it’s also the site of the statue of the Virgin Mary, which overlooks the city, much as the more famous Christ the Redeemer statue looks over Rio da Janiero. Unfortunately, the cable car which runs from the summit by the Virgin to the other end of the hill was also closed for renovation, so there was a little less to see than I was hoping, but it was still a brilliant sight, and well worth the trip. It was getting quite hot by now (32C), so I tried some Mote con Huesillo. This is a ‘drink’ I’d seen advertised throughout my travels in Chile, but I’d never yet tried. I put ‘drink’ in quotes as it would be impossible to consume without a spoon, since it contains wheat and whole peaches. It’s quite nice and refreshing, but also very sweet. To conclude my day, I took the Santiago underground back to my hotel. This is incredibly easy. A flat-price single ticket is 660 CLP (66p). The only thing that confused me is that, because it’s a flat-fare system, tickets are only checked on entry to the underground. You don’t get the ticket back from the barrier, and you don’t have to provide it again to get out at your chosen exit station. And that’s just about it. Tomorrow, I fly back to London (and I’ve been very lucky, too: I miss a strike by aviation workers by a day!). It’s been a great five-and-a-half weeks in Chile; thanks once again to Redgate for giving me the time to do the trip. Once I’m back, there’ll be one final post in this series, covering some of the things I’ve discovered over nearly 40 days’ travelling through the country. In the meantime, a reminder that all my photos (most of which haven’t been included in this blog) are on Flickr, and you can read all the posts in this series. Finally, there’s a map of where I’ve been on my Chile landing page.